In a general context of climate change, researchers at the Centre d'écologie fonctionnelle et évolutive (CNRS/Université de Montpellier/Université Paul Valery/EPHE-PSL) and their international partners revealed the impact of ocean cycles, such as the Pacific decadal oscillation and El Niño, on the survival of the Nazca booby, a species found on the Galapagos Islands. 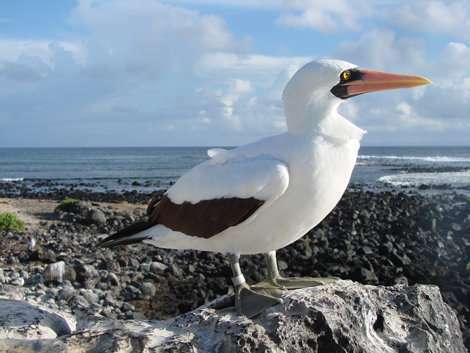 Their research, which shows for the first time that long cycles (spanning several decades) directly affect the survival of adult populations, appears in the May edition of Ecology, and may later be expanded to other sea birds. Several ocean cycles, such as the El Niño phenomenon, occur in the Pacific ocean and have climatic repercussions around the globe (e.g. intense rains in South America, mild winters in Canada, etc.) However El Niño (with a periodic oscillation of 2 to 7 years) is not the only natural and cyclical variation observed in the Pacific: the Pacific decadal oscillation (PDO) is a variation in surface water temperatures which causes significant changes in sardine and anchovy population sizes due to upwelling, a process in which nutrient-rich deep ocean water rises to the surface. 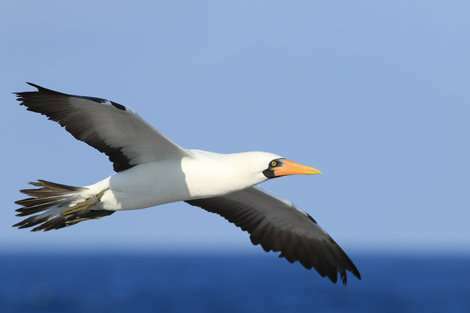 In this study, researchers evaluated the impact of El Niño and the PDO on the survival of the Nazca booby, a tropical sea bird which nests in the Galapagos Islands and has a life expectancy of 15 years. This bird is a good model for the study of the effects of climate change on birds because it consumes resources (sardines, in particular) which are directly affected by climate variations. Using data from the long-term banding of the species between 1984 and 2012, the scientists discovered that survival rates among young Nazca boobies are very low during El Niño events because fish stocks – in particular sardines, the bird's favourite food – are low during these periods. Similarly, the survival of adult specimens is effected by the PDO. Researchers observed a higher mortality rate during warm phases of this cycle, despite their being conducive to the proliferation of sardines and thus easily accessible food. This unexpected correlation can be explained by greater reproduction difficulties: adults are thought to lose more energy in reproduction (less nest abandonment) to the detriment of their own survival. Inversely, during colder phases, such as the one occurring since 2008, adult survival improves because offspring mortality and nest abandonment allow them to recover more quickly. This study is a major breakthrough in what is known about the effects of climate change on sea birds. It shows for the first time the impact of long-cycle climate variation (in this case PDO) on the survival of a species, and could later be expanded to other species of sea birds in order to predict similar effects on these species. If El Ninos happen twice as often in the future, what happens to seabirds?